Our enormous group of fans has been clamoring for an update. Sorry for the lack of posts. As you're probably noticed by now, we are consistently inconsistent with our chump updates. But it's not as simple as just grabbing a random guy. Chump has fairly strict requirements on safety gear, so in some cases guys who have experience doing track events would have to fork out several hundred dollars to buy gear. Also, we certainly have a few qualms about putting just anybody in our car. 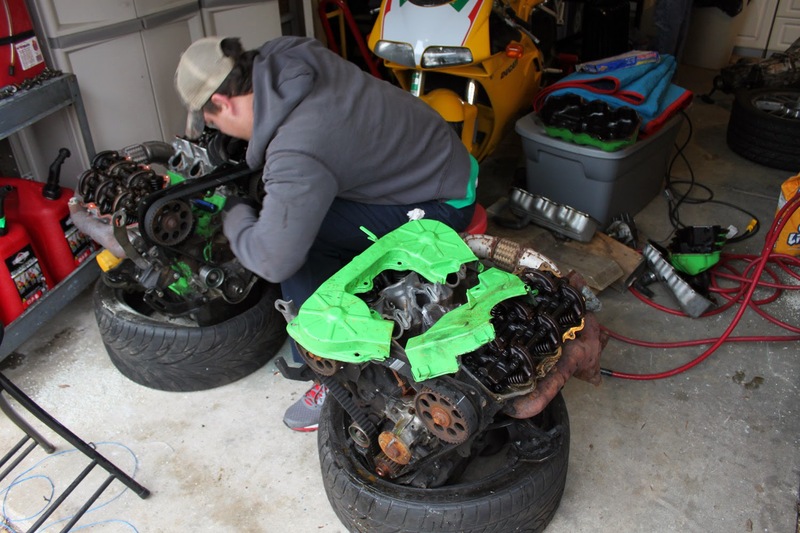 Yes, these are $500 race cars... but that's before spending hundreds of hours and thousands of dollars on roll cages, tires, brakes, engines, and safety equipment. This is an investment we're eager to protect. 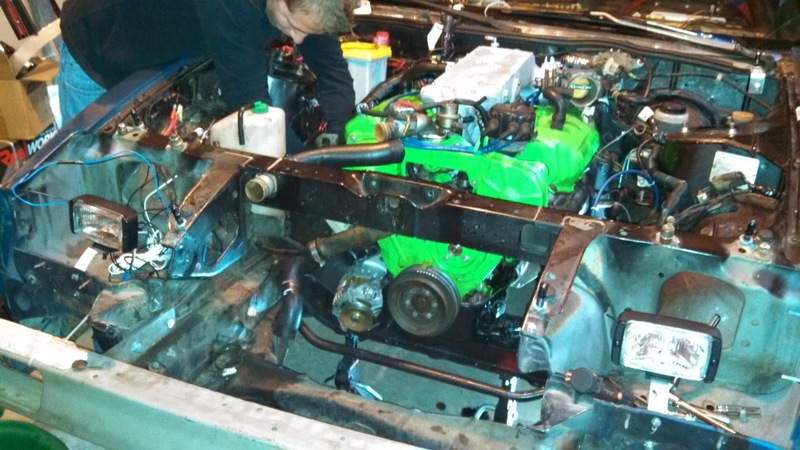 So the new engine is in, and it runs, but we have more work to do in order to finish it up. We are also in the middle of installing the fire suppression system. The next race we are shooting for is the 24hr race at Virginia International Raceway in late August. More to come! Since the last post, the size of our group has diminished. Travis has decided to pursue other hobbies. Duncan has acknowledged he will miss the Road Atlanta race due to family issues. That leaves only three of us. We are actively recruiting additional drivers. We expect to have the engine installation finished this weekend. We are currently installing a new temperature gauge that will give us a more precise reading during our races. Considering we've had some overheating issues twice now, the gauge along with the new radiator should help to improve our reliability. 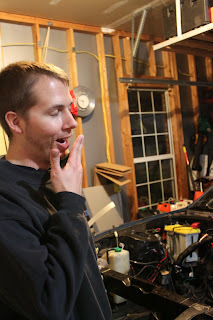 The new sensor for the gauge was sort of holding up installation of the old intake manifold onto the new engine. But that is almost complete. 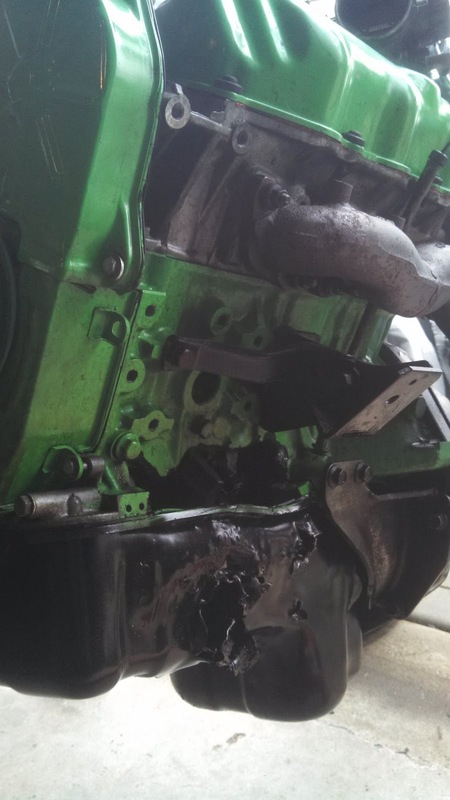 We took the old engine to the junkyard, and got a whopping $30 for it. Wowzers, with the gas we burned getting there and back, we would've been better off chucking it in Eric's back yard and using it come summertime to sit our beers on. 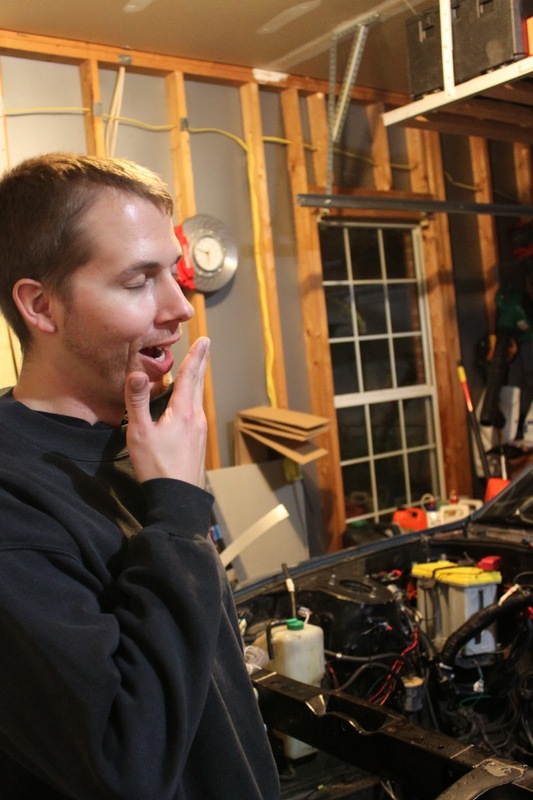 It's time for Eric's neighbors to get an even better taste of this whole Z31 parts depot anyway. Jason is kind of our engine guy, and since the engine went boom it's important that we give him a hard time. 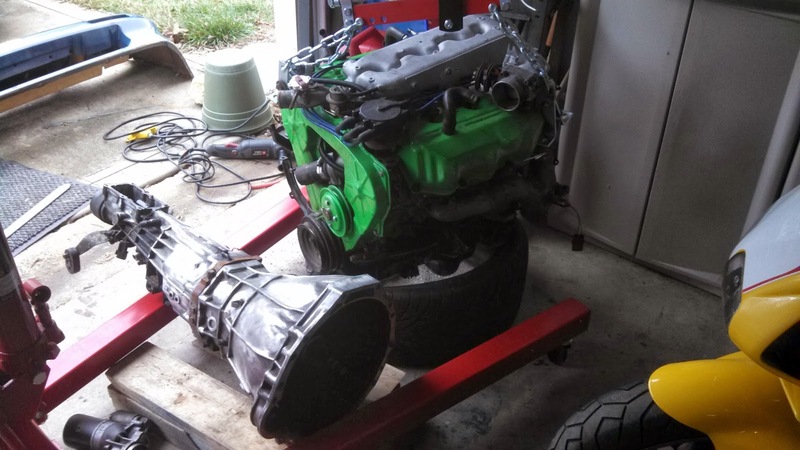 He swore he would have the new engine ready to drop in within four hours. Trust me, it took a LOT longer than that. A few of us hit up the Christmas parties the night before. Not much sleep was had. A few adult beverages were consumed. Made for a really long work day. Here we see Eric yawning and sleeping on his feet. We bought a new radiator. The old one had too much bad juju. 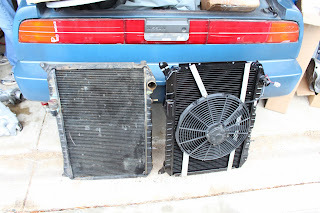 We had overheated the car in two different races, so even if it wasn't the radiators fault, out it goes. The next race we are planning on is Road Atlanta. This is in 8 weeks, Feb 8-9 2014. This would be our team's third race. 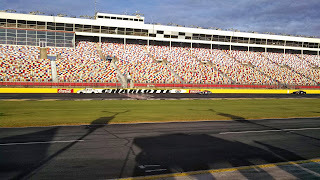 Both our previous races were on a speedway (Charlotte Motor Speedway). Generally, ChumpCar converts the speedway by using part of the oval, part of the infield, or adding some brake/turn elements somewhere. Road Atlanta is an actual road course. 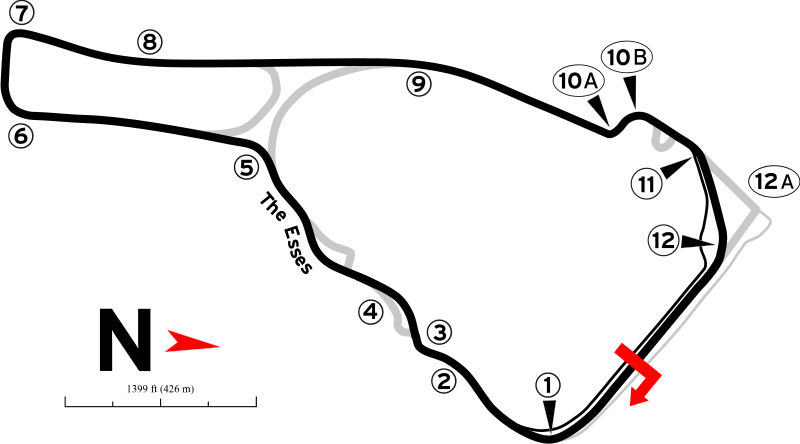 It is 2.54 miles in length, with twelve turns and plenty of elevation changes. It is a phenomenal track. I've been to Road Atlanta many times to see the Petite Lemans races, but I honestly never thought I'd be there as a part of a race team. 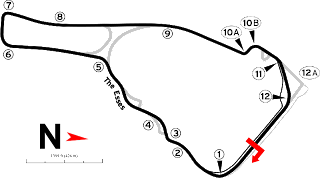 The track was opened in 1970, and immediately served as a host for Can-Am races. It was sold several times, sort of declined, and went bankrupt in the early 90's. It was purchased by Panoz in the mid-90's and a bunch of improvements were made. Panoz is also the one that put the kink at the end of the back straight to keep people from going airborne and becoming roadmeat. A 1:06.2 is the current lap record, and something tells me we will not beat that in our Z machine. This will be a learning experience for our team, and we are excited to get out there and get some more seat time. We feel like we are slowly dialing our car in, and we're hoping it's more reliable this time out. 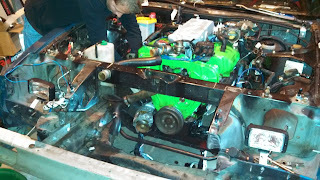 We broke Eric's new engine lift in right by hooking it to a very damaged VG30 and yanking it right out. Other than hanging the shifter up for a minute, we really didn't run into any problems. The two of us probably spent 3.5 hours total pulling it out. That was at a somewhat leisurely pace, taking time to label wires, fab some brackets to mount to the engine tabs, and stopping every 17 minutes to do 15 pullups. Cause that's how we roll. We haven't torn into the old engine yet, but the carnage is magnificent. There is a gigantic hole the size of a baseball (maybe softball?) 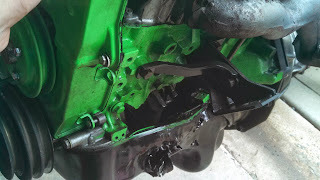 in the left hand side between the block and the oil pan. It's conceivable the heads are salvageable, but we suspect they are warped. If water got into the oil, anything that was supposed to be lubricated will have gotten a thrashing. We will take a look later. Whatever can be salvaged off the old engine will be. We'll reuse the transmission of course. A couple of us got the process started last night. Pushed the car into the garage, got it up on jackstands. Dropped the exhaust. Unbolted the driveshaft. Unplugged and labelled all electrical and fuel connections. Pulled alternator off. Removed nose piece, radiator. 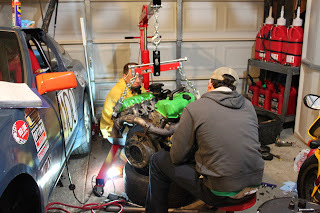 We think we can finish pulling the old engine out over the course of a couple of hours this coming weekend. Jason is scheduled to come up with the spare and we will install the weekend of 12/17. 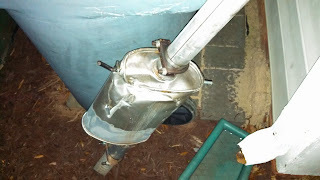 Looks like the spring dug into our muffler and gave it a real hard time. Not only is it bashed in and wrinkled, it actually gouged a couple of holes in it. We may replace it or... then again, this is ChumpCar. We may cover the hole, rebend the hanger, and slap it back on. 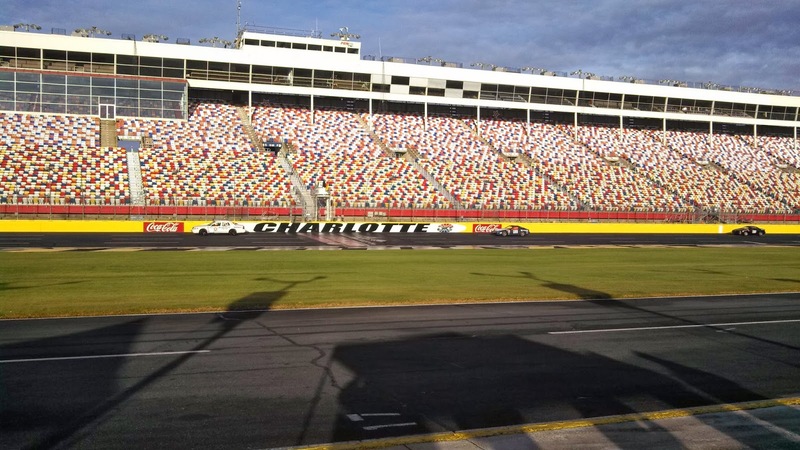 We'll close out today's update with a shot of the Z31 RACECAR BEAST barreling down the front straight of Charlotte Motor Speedway. After the last race, we have to get ourselves some new Zip. A couple of us plan on doing some prep work the week after Thanksgiving. 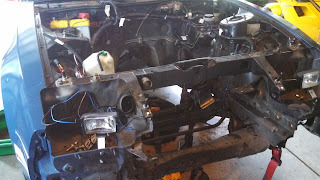 We will unhook the wiring, hoses, intake, remove the radiator, driveshaft, exhaust. Then the weekend after, we hope to pull the old (ventilated) engine out. We will spruce up the spare engine with a new timing belt and some gaskets, then swap it in.